Also that might be 1980, not 79. A couple of pics from bouldergrove in 78. Looks like Dave Wildman's cariboo motorcycles van with the back doors open in your top pic Bernie,I remember them more from road racing but obviously they did some mx too. Could be, I thought that was Modern M/C? You know the starting line was in the same place the whole 14 or so years, some people think thats a different location because of the trees. 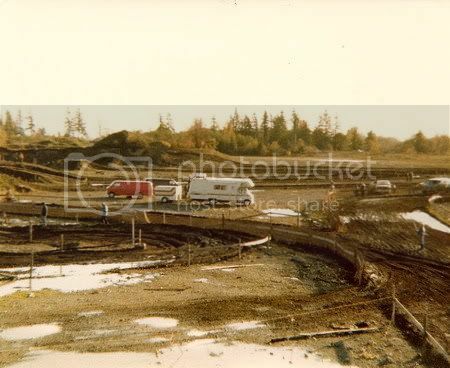 That area was dig out and became the huge pond. 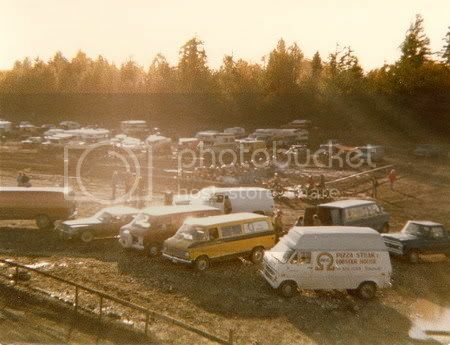 Pretty sure it's Wildmans Cariboo van it has the big triumph logo in the yellow area on the side,I thought that the background looked odd in your pics your but your description explains it (no lake) these pics are before my time out littlerock thanks for showing some track layout history,some of the more interesting races out at littlerock was in 1987,88 last rounds of the B.C championships old Walter ran the course out from the track onto the lakebed(it was dried out) up into the hills and back down to the main track again,it was a pretty cool layout,I'll see if I can find some pics. Yes Steve I remember that, I think 87. I was in the 500 sr class. I heard it was Marv cross that put that section in there, I dont recall many people who liked it. In 87 it had a very narrow steep dusty downhill section that claimed alot of victims,In the 125 jnr race I was in, on the first lap there was a huge pileup there that took out what seemed like 1/2 the field,now that I think of it I can see how riders might not have liked that section! .Scott Gillies from the island won the 125 snr class title in 87 if I remember right. The 1988 layout was more open and flowing and much improved over the year before and my friends and I liked it,don't know what other riders thought of it ...Hammer if you read this what did you think of that 88 layout I know you were there in 88 it was the race where you borrowed my muffler cause yours broken. These were actually slides, my dad has been putting on his computer. Explains why some are reversed !! As for the year, anyones guess. I know that Hoffos had that pre production water cooler way before anyone else did. The rad was pretty much home made.